The Second Approach project's origin is Russian culture, if we mean Feodor Dostoevsky, Sergei Prokofiev, Mark Shagal and Slavic songs. Their style of improvised music was definitely and unmistakably born in Russia. What the band performs seems to be beyond standard definitions and provokes controversy, interest and sympathy. 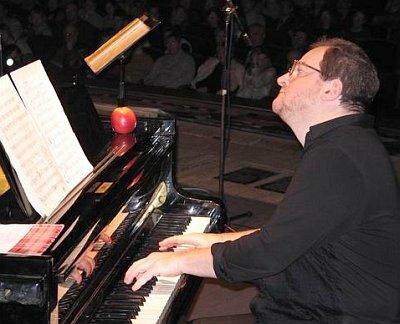 The leader of the trio is experienced composer, master of piano improvisation, Andrei Razin. Unique singer, member of well-known Gypsy band Romen, Tatiana Komova, and one of the key acoustic bass players in Russia, Igor Ivanushkin, complete the band. The musical arsenal of the Second Approach combines the elements of ethno music, modern creative jazz and contemporary classical music. The ideas of the Second Approach lie in the area of pan-European spirit of the 21st century, enriched by Russian traditions. This is why the idea of work with this trio attracted so many high class musicians, from the French horn great Arkady Shilkloper and sax man Oleg Kireyev to his fellow saxophonists Mike Ellis, of New York, and Yuri Yaremchuk, of West Ukraine. In 1999, only one year after the band was created, it was nominated for Russian Jazz Journalists Association Awards in three categories. In March 2001, their CD "Ex Tempore" has been released both in Germany and Russia, while the trio performed in Stuttgart, Germany, at filmmaker Andrei Tarkovsky's retrospective with "In Memoriam Andrei" program. That same year the trio played at Kassel Jazz Festival (Germany) and at Jazz of Four Cultures Festival in Lodz, Poland. The Second Approach Projects also takes part in the annual Jazz Province moving festival that tours several major Russian cities. Their music finds its way to the airwaves on Russian radio stations and TV. In autumn 2002, the Second Approach toured several festivals in Ukraine, Moldova and Northern Russia. Their new CD "Jazz, Please!" contains music that was recorded live during their performances at International Jazz Music Days in Vinnytsia, Ukraine, at Ethno Jazz Trio Festival in Chisinau, Moldavia, and at the Jazz Days in Arkhangelsk, Russia. The feeling of the vividly intense improvisational, aspired interaction with the audience is the most valuable result of that work. Moscow Jazz Journalists’ Association rewarded Andrei Razin diploma "The best jazz composer of the year". 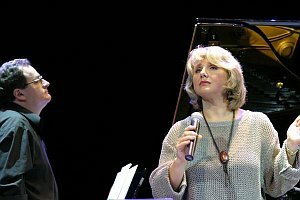 In October 2004, the trio has celebrated its fifth anniversary with a concert program entitled "The European Jazz - 21st century " at the Moscow International House of Music. The title of this concert looked symbolical and has formed a basis for the concert series at the House of Music. At that evening, the trio performed Andrei Razin's suite which was later released on CD as "Event Space" (Dialog Music, 2004.) In 2004, Andrei Razin’s Second Approach trio also performed at the Christopher Summer Festival 2004 in Vilnius, Lithuania. In December 2004, Second Approach performed in Finland (City Theater, Joensuu, and Kaamos Jazz Festival). Their performances in Finland also took place in 2005, when the Second Approach played at Kerava Jazz Festival. Other successful festival appearances in 2005 included Varangerfestivalen in Norway and Varna Summer Jazz in Bulgaria. A very unusual experience was the trio's non-amplified acoustic performance at the Organ Hall in Tomsk, Siberia, during the 2005 Edison Denisov Contemporary Music Festival. Graduate of the Moscow Conservatory, composer, pianist and arranger, Laureate of the National Festival "Art of the Young", Laureate of the National Competition of Young Composers, Member of the Russian Union of Composers, Andrei Razin was destined for the career of an academic musician, but his creative interests have a much wider range. He produced music scores for the theatrical performances, modern chamber instrumental and vocal music, jazz compositions, music for TV shows and advertisement videos, symphonic music. Razin participated in Russo-French Festival of Modern Improvisational Music, and numerous other festivals, performed with Arkady Shilkloper, Mike Ellis, Vladimir Chekasin, etc. Andrei Razin was also awarded the ’’Composer of the year’’ (2002) awards by Russian Jazz Journalists Association. As a leader of Second Approach trio, Andrei Razin performed in Germany, Poland, Lithuania, Ukraine, Moldova, Belarus, and Finland. While still in the music college in her native Dnepropetrovsk, Ukraine, destiny brought her to Mikhail Tsygutkin's Gamma ensemble, which sung vocal versions of instrumental music by Bach, Mozart, and Vivaldi. The ensemble performed at various jazz festivals, including one in Moscow. 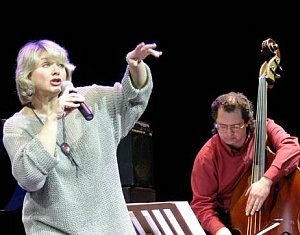 In 1983 Tatiana moved to Moscow and, having entered the Institute of Culture, started to sing the jazz repertoire. At the same time, she could be heard on radio and TV performing Bach and Rimsky-Korsakov. In 1986 her talent was demanded by the world-famous Gypsy ensemble, The Romen trio, which two years later turned into her duet with Georgy Kvik. Duet Romen was warmly greeted in more than 30 countries, including France, Germany, Italy, USA, Japan, Israel. Duo's 3 CDs enjoyed good sales and critical acclaim in Russia. In 1995, she was awarded the title of Merited Artist of Russia. Komova's connection with jazz was never broken, though. Now her interests lie in the sphere of modern blends of jazz, classical, and traditional music of various ethnic cultures. Igor's professional career in music performance started while still a student of the Gnessins' Music College in Moscow. Having then graduated from the college and then from the Gnessins' Russian Academy of Music, Igor played with Igor Bril and New Generation ensemble for 5 years (late 1980-s - early 1990s). During the following years, he performed with the big band and combo led by Aleksandr Sukhikh (tour in Austria), in Vyacheslav Preobrazhensky Jazz Band (Pori Jazz Festival, Finland), etc. Within the framework of cultural exchange, he performed in Dublin, Ireland. Igor also performed with guitarist Konstantin Serov's group, with trumpet player Vladimir Galaktionov, occasionally backing the Kramer Trio (three Russian jazz stars - George Garanian, Daniel Kramer, and Alexey Kuznetsov). Igor is participant and laureate of numerous international festivals, including ones in Indonesia (1991, 1995), winner of Grand Prix of competition of jazz performers in Bucharest (Romania), laureate of International competition of jazz musicians in Brussels (1990), laureate of the 1st All-Russian competition of young jazz musicians (Rostov-on-Don). Igor is also a participant of Arkady Shilkloper quartet (2001). In 2002, he performed at the Odessa Jazz Carnival in Odessa, Ukraine with the great Israeli saxophonist Roman Kunsman at what happened to be Mr. Kunsman's final performance shortly before his death. Sie nennen sich „Second Approach", und schon der Name deutet darauf hin, dass es sich um ein Projekt handelt, um den „zweiten Ansatz", dargeboten von drei Musikern, die alle zwar aus Russland, aber aus unterschiedlichen musikalischen Richtungen kommen. Grandios ist das Spiel des Andrej Razin, der am Flügel mit seinen präzisen Stakkati überzeugte. Voller Melancholie erklingt dazu der weiträumige Vokalgesang von Tatjana Komova, eine Stimme, die mit ihrer Ausdruckskraft bisweilen an den Gesang von Lisa Gerrard erinnert, der Front-Frau von „Dead Can Dance". Kraftvoll erklingen die Bassfiguren von Igor Ivanuschkin. Der nach ihm benannte „Ivanuschkin Boogie" wird später zu einem groovenden Duo mit Andrei Razin mit Anlehnungen an amerikanische Boogies wie auch an die Melodien russischer Volksweisen. Jazz of Four Cultures is a new festival that took place in Lodz, Poland's second largest city, on Dec. 14-16, 2001. The festival represented all four ethnical elements that formed Lodz's cultural heritage - Poles, Russians, Germans and Jews… Pianist Andrei Razin and the Second Approach Project represented Russia. 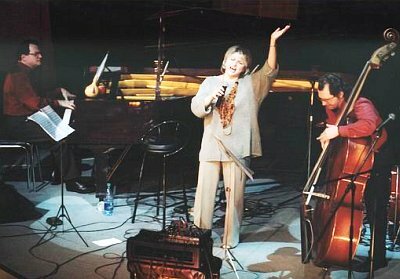 One of Russia's most uncommon jazz collectives, it was created in 1998 to perform its leader's music on the sharp edge between jazz and modern classical music, with rich elements of different ethnic influences, brought to the Project's sound by singer Tatiana Komova who mastered Gypsy folk singing tradition. Second Approach & Yuri Yaremtchuk "Yurassic period"
Second Approach feat. Mike Ellis "Ex Tempore"
Andrei Razin - Igor Ivanushkin "Something From the Past"
Andrei Razin & the Second Approach "Pierrot"
Tatiana Komova - Andrei Razin " Second Approach"